Thank you so much to everyone that stopped by and commented in the From Bump to Baby Blog Hop! Y'alls comments are so sweet, and I loved reading about the various things that everyone would make! 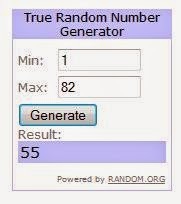 And now for the exciting part.... the winner of the giveaway is! Thanks! I'm so excited that I won! Life Lately - We Tied the Knot!